I scratch my head and wipe the sweat from my brow. One of my summer interns found a little plant, under a bunch of big plants, and we thought for a second it might be the same as the big plants, but it is definitely different. It’s our first field day. We don’t know what this plant is called, and it’s a hot and humid summer day in Chicago, and we have been searching through our identification guidebooks for what seems like forever. “Is it this one?” we ask each other, pointing to pictures in the book where the leaves kinda sorta look like our little plant. Finally, we flip through the book one last time, and it seems to open all on its own to the right place. It’s called water horehound (Lycopus americanus). We cheer! Now that we know this little plant’s name, we start to see it everywhere. 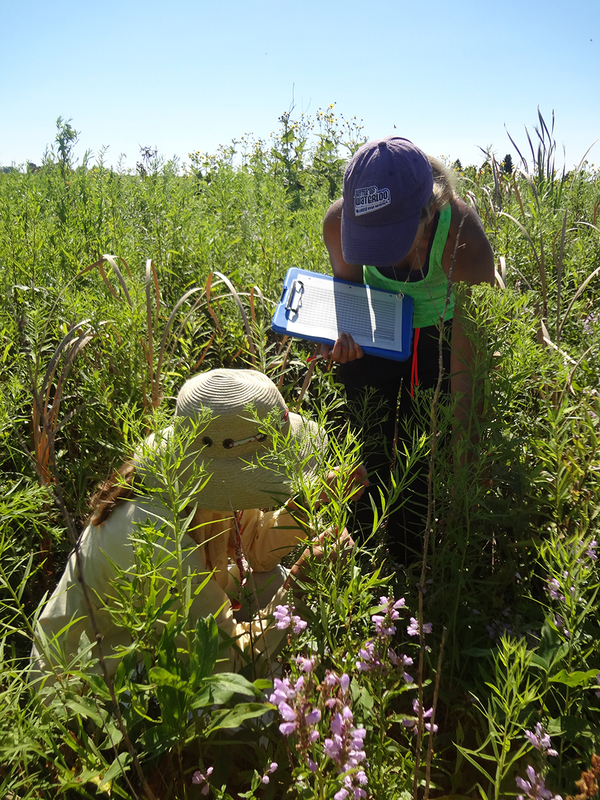 I’ve been working all summer with a fresh-faced team of undergraduate interns to quantify plant community biodiversity (i.e. 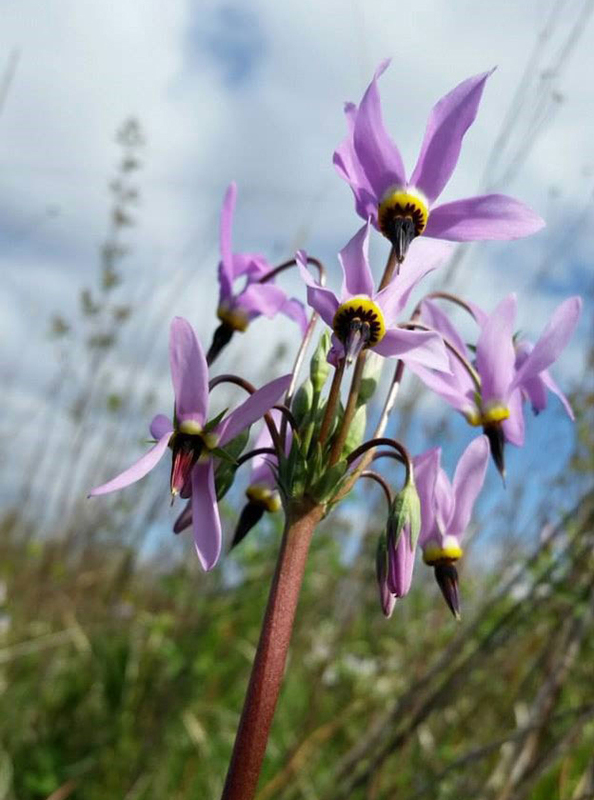 identify and count plants) in restored prairies around Chicago. Some of our sites have been right by the lake, some have been in community parks, some in forest preserves, and one in what seemed to be a drainage ditch. So far, we have identified more than 200 plant species. Biodiversity is all around us. And I’m not just talking about in the tropical rainforest or a coral reef, though there are many species there, too. Even in the temperate zone, even in a park, and probably even in your backyard, there are many species. A species is defined as a group of organisms that can breed with one another. While most people would feel comfortable declaring that an elephant is different from a carp, an oak tree, or a shiitake, there are often much more subtle distinctions that can signify that organisms belong to different species. To humans trying to identify plants, the distinction between two species could be as minute as whether the leaf hairs are hooked or straight. Seeing species is hard but worthwhile. It will help you develop keen observation skills, and (I hope!) an appreciation of the world around you. Before we can identify what a species is, we first have to determine that it is something different from the other surrounding plants. We tend to look at plants as a bunch of green stuff, not always recognizing the diversity present even in seemingly mundane habitats. We call this phenomenon “plant blindness,” the tendency to see plants as background, and not as unique organisms. My Ph.D. advisor said I should call our inability to recognize differences between species, “species blindness” (The only other reference I could find for species blindness was in Rutgers University Professor Lena Struwe’s bioblitz project). Recognizing differences among species is only the first hurdle. Then, you have to identify them. The identification can be confounded in many ways, like the issue of timing. Some species may be distinctive at maturity but can remain a mystery at other times. 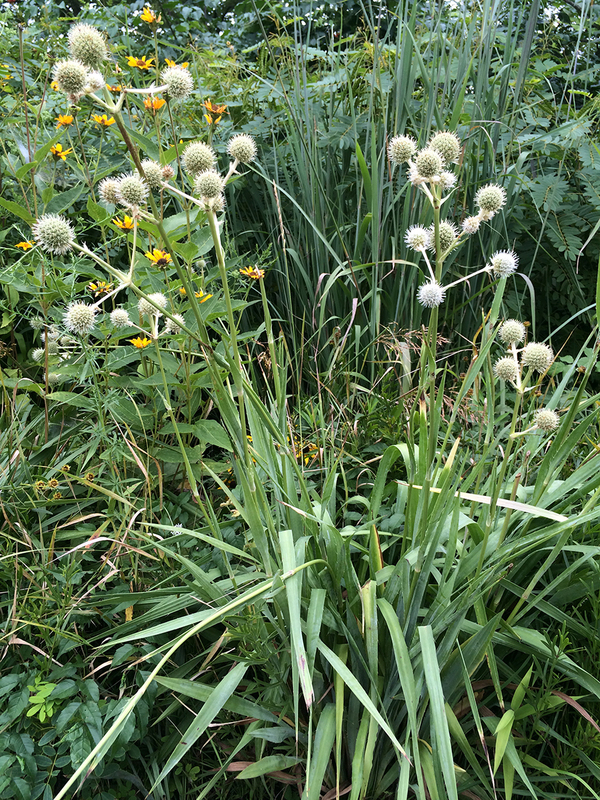 Take rattlesnake master (Eryngium yuccifolium). There is no mistaking the master when it’s flowering. The flowers are small, green and white, but are contained within a spiky ball of a flowering head. The leaves are thick, pointy, and spear-like, prickles sticking out all along the edges. But when the mighty rattlesnake master pokes out of the ground in the spring, you would definitely mistake it for a grass; there are no flowers, no spiky balls, no spears. The only way to know it isn’t a grass is to observe the sparse, puny prickles just starting out. The distinctive rattlesnake master (Eryngium yuccifolium with co-occuring species. How many can you spot? And while we’re at it, let’s talk about grass. (No, no I am not talking about marijuana.) Botanist Chris Martine already addressed that in his essay, “I am a botanist, and no, I don’t grow marijuana.”) I just mean grass, the stringy green stuff that grows out of the ground. This demonstrates another hurdle to combating species blindness: the sheer number of species out there. Guess how many species of grass there are. Go ahead, guess. The Royal Botanic Gardens, Kew keeps a database of grasses called, of course, GrassBase. Currently, GrassBase includes 11,313 different species of grass. Grass is actually a plant family, containing many different species (please see this amazing rap if you need a refresher on biological classification). As you can figure out by exploring an overgrown park, an abandoned field, or my favorite place to study grass, a prairie, there are grasses that are incredibly distinctive. Some have seedheads that smell like popcorn! Sometimes, though, the grass isn’t blooming (grasses are flowering plants, by the way), and you end up pulling back leaf after leaf trying to find a ligule to help with the identification. A ligule is what’s found where a grass leaf blade meets the stem. The ligule can be rigid or floppy, membranous, or hairy, or totally absent. Once you know that the ligule exists, you might try to find it on any and all grasses you pass (I do!). Once you’ve found a distinct species, how do you figure out its name? We budding botanists have a few tricks. We search through field guides so many times that we memorize the pages for certain families. We spend a lot of time looking at the glossary of our field guides, trying to remember the meaning of botanical terms like panicle, petiole, connate, cordate, corolla, and cyme. We use multiple senses. We are known to crush leaves and breathe deep, searching for the piney smell of a goldenrod, the freshness of a mountain mint, or the musk of bee balm. We are almost obsessive about our rubbing of leaves to distinguish new textures. And we hunt for tiny clues (often with a hand lens) like a line of hairs down a stem or a gland at the base of a hair on the edge of a leaf blade. We value the time we get to spend in the field or the lab with expert botanists that put our identification skills to shame. And when all else fails, we post to Twitter or Facebook botany groups and someone always knows. 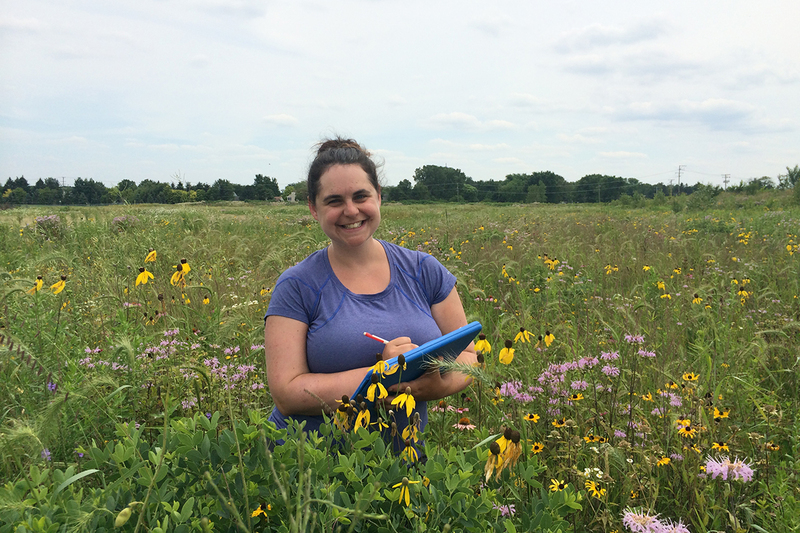 The best part of the job—doing research in the field! I’m asking you to combat species blindness by working hard to notice species. Dig a little deeper, look a little closer. If you’re out with children, challenge them to find as many different species as they can. At first glance, it may seem like everything is the same, but with careful observation, the species will begin to show themselves. Look at all parts of the plant. Flowers sometimes get all the love, but stems and leaves and fruits and seeds can hold the keys to identification. Plants are a good place to start because they are known to stay in one place, but the same patterns apply to all living things. Biological diversity is out there; you just need to know how to look.